Winter Semester 2014 starts this week on the 9th and 11th January. There is one place left in the Thursday class, and five left in the Saturday class. So please register now if you are interested. 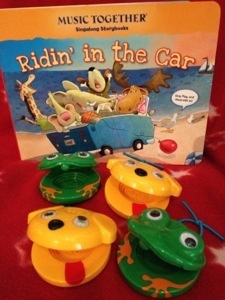 We have some new cute maracas for the play along basket “woof” And “ribbet” 🙂 And a fun new Singalong Storybook for the song ‘Ridin’ in the Car’. I look forward to seeing you all and singing and dancing away the cold this winter.